as a prelude, you can read my short itinerary for malacca and our transportation dilemma in malacca in my previous posts. 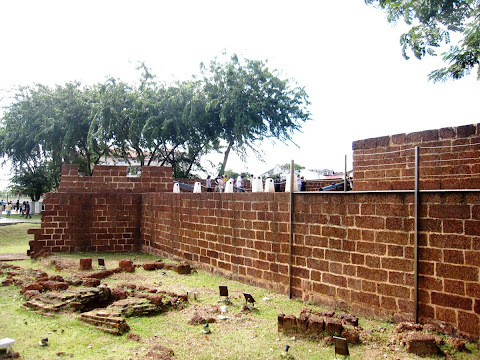 if you're up to reading a tedious composition, i also have a post on how we got to malacca from singapore. malacca is a laid-back destination that you don't have to fret because you're running out of time. 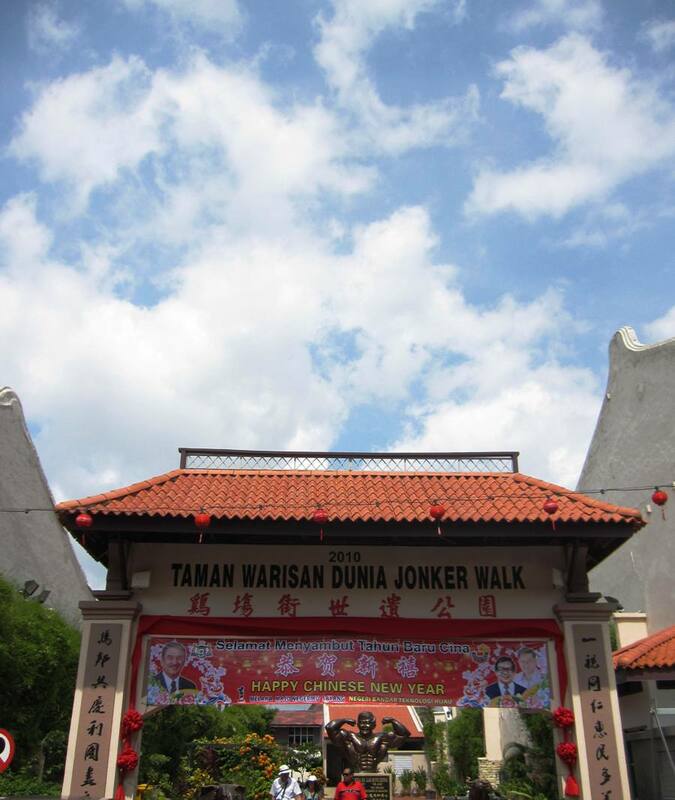 malacca gives you plenty of time to actually feel what it has to offer whether by dining al fresco along the malacca river or taking a stroll along its historical streets. i was expecting that we would reach malacca late in the afternoon because of presumed traffic in both immigration controls in singapore and malaysia but we actually arrived in malacca rather early. we immediately started our day 1 while bracing ourselves for the blazing sun. as we did not have a decent breakfast, we firstly searched for the nearest available food and we were left with only a few choices since most of the shops were sadly closed. it was the height of the chinese new year festivities by the way. i was actually more famished than breinn because in the bus, he furtively gobbled down the entire sandwich that i made and i was left to fend off my hunger with white rabbit candies. 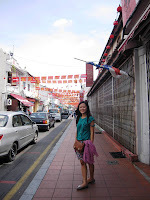 to avoid another yet long narration, i will be making a different post for the food that we had in malacca. after we appeased our stomachs with food, we began our jaunt starting from jonker street which is just a parallel street of our hotel. we came across this muscle-builder statue which amusingly reminds me of johnny bravo, the cartoon character. for fun, i told breinn to do a similar pose under the sun while i took the photo under the shade. getting back at him was easier than i thought. 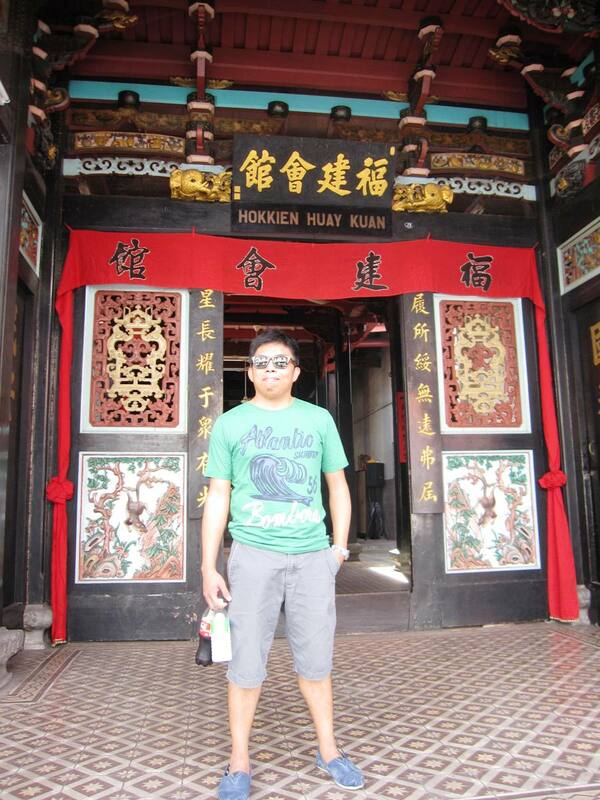 this statue represents gan boon leong who is the father of bodybuilders in malaysia with mr. universe, mr. asia, mr. malaysia, and mr. melaka in his portfolio! this statue stands at the front yard of his body building academy. 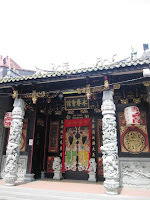 typical adjoining chinese houses line in rows along jonker street and similar setup can also be seen in the neighboring streets. 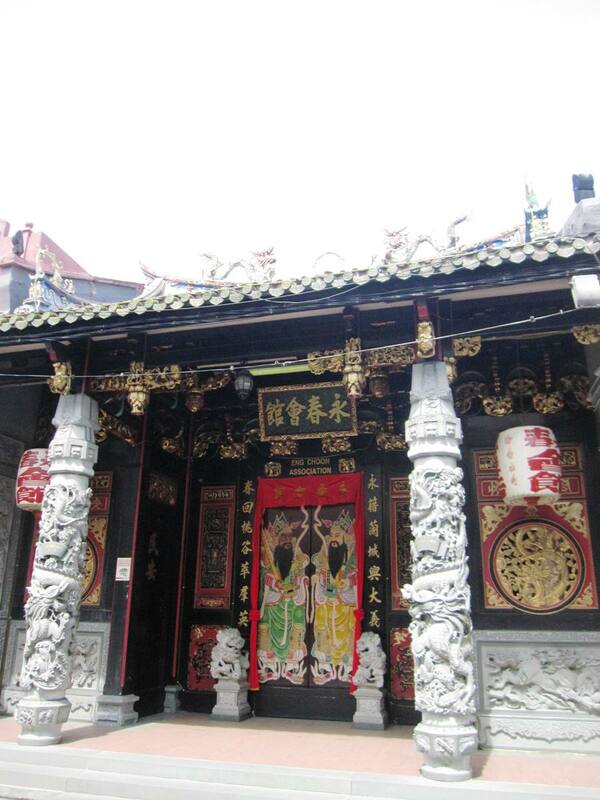 in between these houses are few small temples. 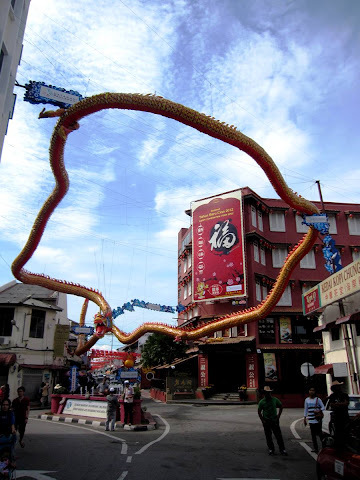 in the merging section of these streets, a long inflated dragon was suspended up in the air to signify the new chinese astrology sign for the lunar new year, the water dragon. it is said to be the longest dragon in the world and it competes for a guiness recognition. well, that's what our chattering taxi driver relayed to us, when we were heading back to melaka sentral the day after. 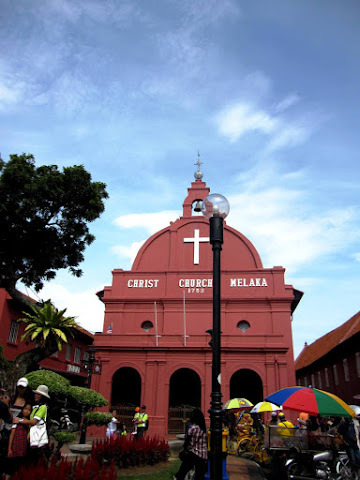 moving on, as we continued our gut-feeling walk, we successfully arrived in christ church melaka by crossing a small bridge. we didn't actually have a map nor bother to ask anyone because i was confident that what i had envisioned during my pre-roundabout in google map would suffice. fortunately, it did! to my relief, we already saw the crimson edifice from the inflated dragon's point. 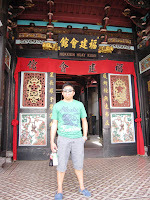 ok, i confess it's not something of a profound achievement for there were a lot of tourists all over malacca. you only have to follow the crowd and you'll surely be on the right way. christ church melaka is a protestant church, founded in the year 1753 as seen in its facade. 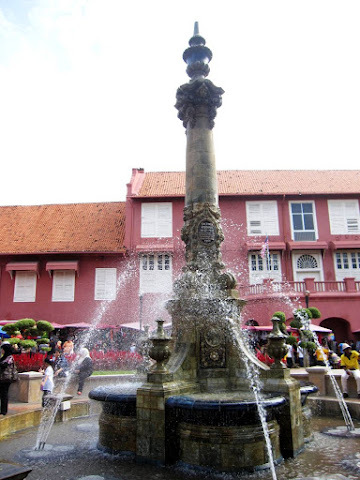 this famous landmark of malacca signifies the dutch rule in the state during the 17th and 18th centuries. the clock tower is right in front of the church with only an enticing water fountain separating them. 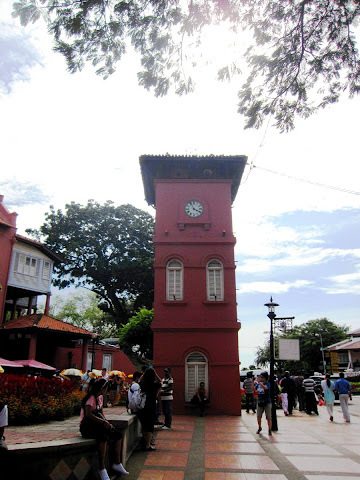 this clock tower is named as tan beng swee clock tower, built by an upper-class chinese family. we unfortunately missed the stadthuys because we were thinking of the entrance fees. we should have gone inside in a heartbeat because admission is free after all! 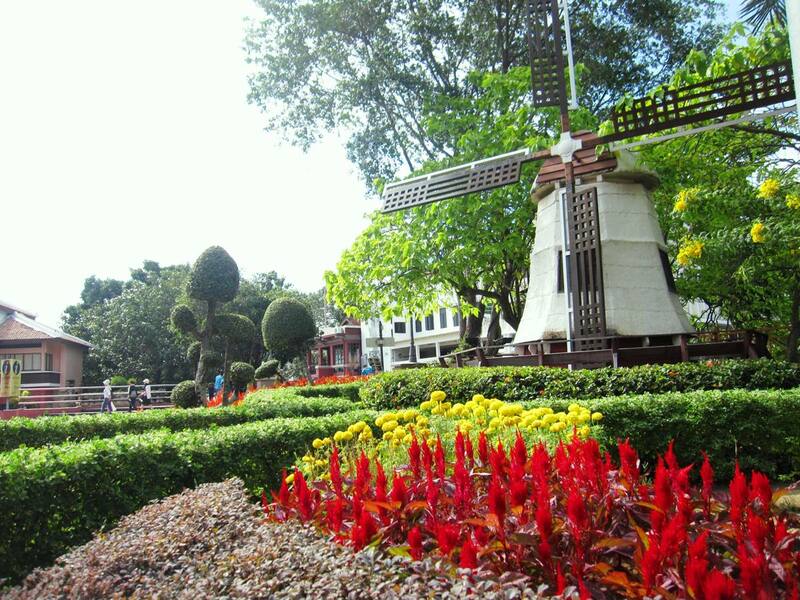 stadthuys is another structure from the dutch era and it is likewise known as the red square. it served as the office of the dutch governor then. we didn't even have a sole picture of the stadthuys! obviously, this picture's subject is the water fountain. our minds were probably shadowed with the idea of jumping into this fountain to cool off the melakan heat. 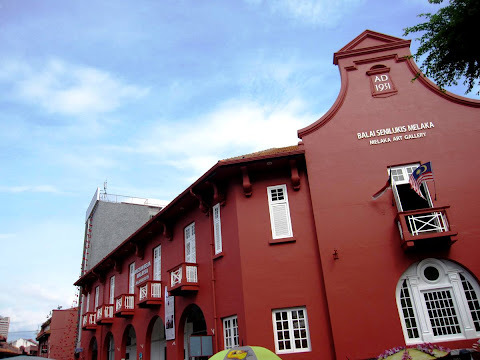 like the stadthuys, we also did not go for the melaka art gallery. as my feeble consolation, i reassured myself that we were not the artistic types. so, if ever you find yourself in malacca, please pay this gallery a visit and tell me what it's like. this art gallery is on the left side of christ church. so basically when you reach this junction, you can see the above 4 historical spots all at once. thinking of the netherlands, it's most likely be about windmills and the myriad of colorful flowers in full bloom during spring! 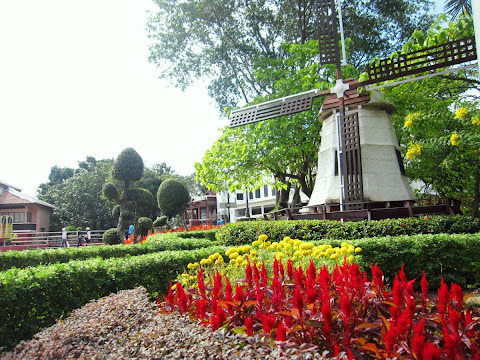 to add more impact to the dutch influence in malacca, there's a small patch of the netherlands feel here. it looks pretty! we were not on our malacca river tour yet. we only saw this fortress along the way but we didn't climb over. however, its canons make us think of a similar structure back in cebu, the fort san pedro, although the latter is much bigger. all these historical spots can be covered by walking in a relaxed pace, with enough opportunities for narcissistic shots. i kid, i kid. although there's partly a truth to it. when breinn and i were almost scorched, we rested for a while and lounged near the fountain with everyone else. it was a pleasant thing to do for we got to observe everything around us. malacca: a local bus or taxi?